We Venture out with Dear Friends | Sprezzatura, Y'all! People ask us all the time what we miss about the US. The only thing we really miss are the people dear to us – our family and friends. 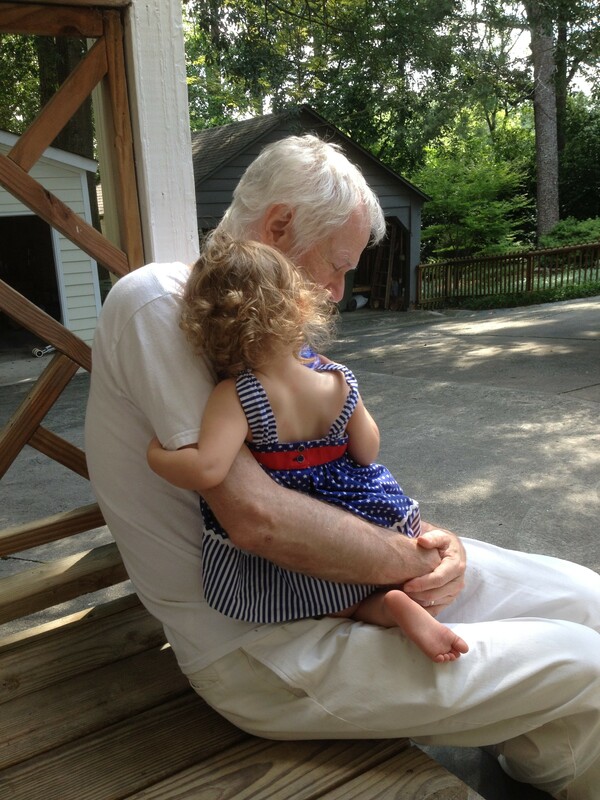 We miss them terribly. Sometimes so much it hurts. 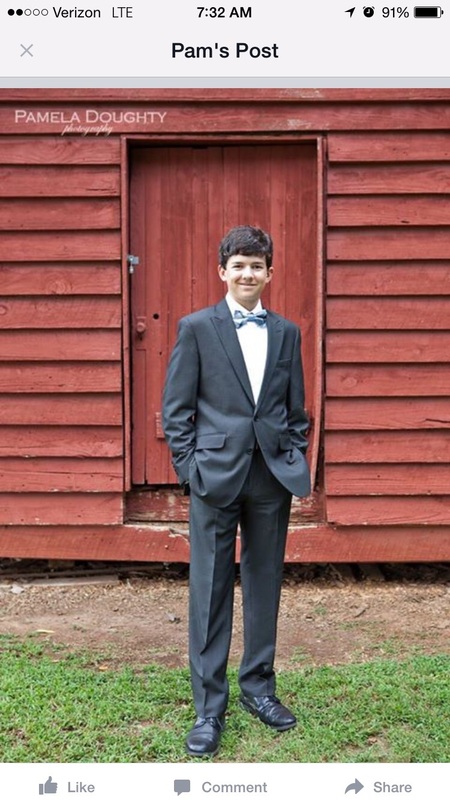 Our grandchildren are growing up without us. Our oldest had his first date and our youngest is talking in full sentences. We try to keep in touch with them, but nothing can match being together and talking – hearing about what’s going on in their lives and what’s important to them. Seeing their faces. Touching their hands. That’s why it’s so wonderful when friends visit us. Our dear friends David and Edith are our first guests and we are thrilled to have them and to travel around Italy with them. Sometimes when we’re out alone and we hear Americans talking we don’t like it – it feels strange because we’re now so used to hearing Italian most of the time. Hearing Americans is odd in a way – just not quite right. But having our friends here who we can talk to and communicate with and hear that wonderful Southern accent is different. It’s like a gift all wrapped up just for us. It’s a little piece of home, and a piece that we miss so much. 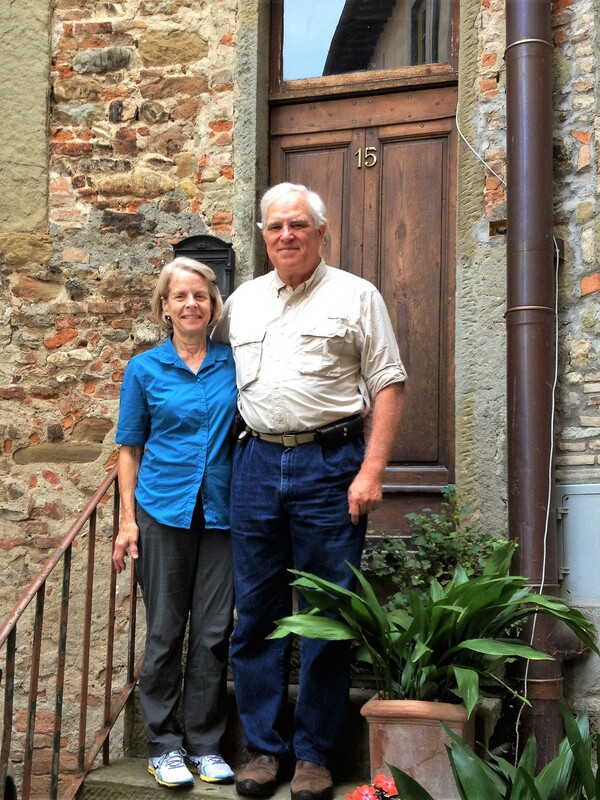 David and Edith have traveled extensively around the US and Europe, but not very much in Italy. We took the list of things they wanted to see and do and whittled it down to what we thought was possible in the time they had here and came up with a nice itinerary that involved some travel and some close to home visits. 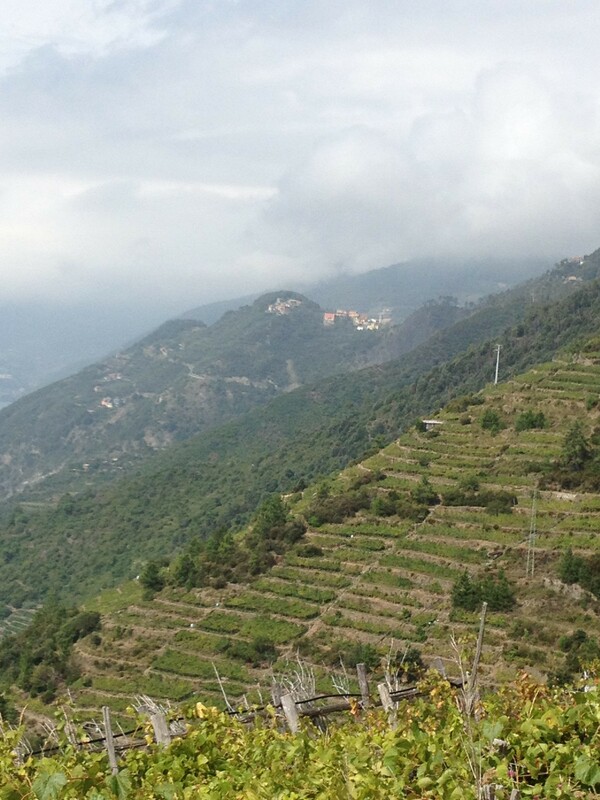 Our most adventurous trip was to the Cinque Terre on the Italian Riviera. For this trip we took the train (which we missed on the way over – long story, happy ending) and left Millie the dog with Michelangelo and Rosella (thanks so much!). The Cinque Terre is one of the most picturesque spots in Italy. Even if you’re never been there you’ve probably seen pictures. Cinque Terre means Five Lands and is on the Ligurian Sea just where it joins with the Mediterranean. 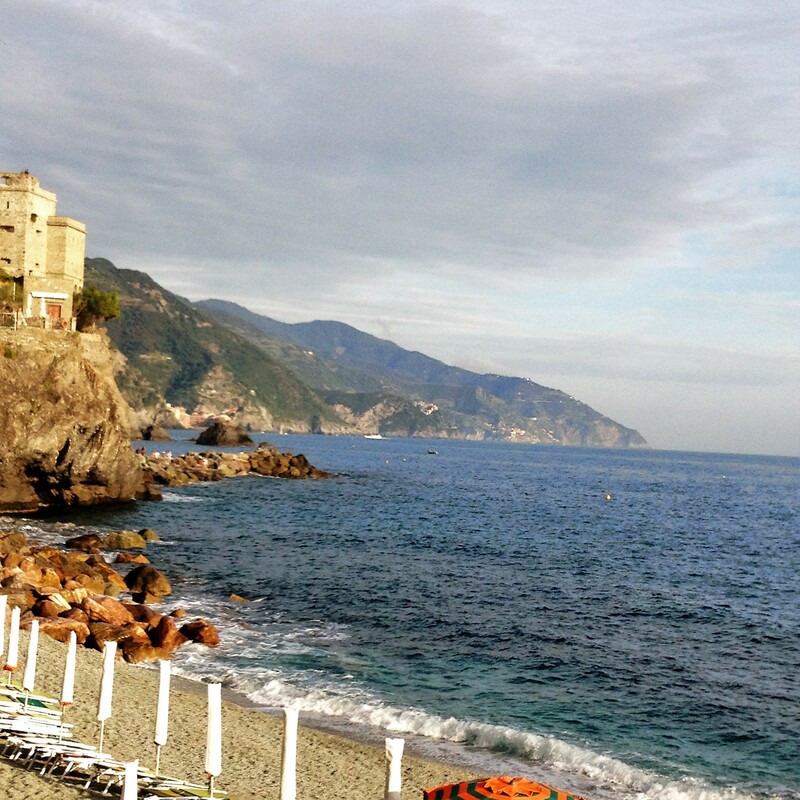 There are five little coastal towns that make up the Cinque Terre, starting on the east with Riomaggiore, then Manarola, Corniglia, Vernazza, and finally Monterosso al Mare. They’re tiny fishing villages that are carved out of the steep cliffs that keep the sea contained. This area is known for wine production, seafood and pesto. It’s a rugged place that started out as a strategic outpost for the Roman Empire until the 9th century when the Saracens captured it. After ousting the Saracens in the 11th century, the villages we see today started to take shape. In settling this land, the locals built terraces into the cliffs separated by dry-stacked stone walls. These walls still stand today and dutifully serve to provide some degree of levelness to this vertical landscape. On these terraces they planted grapes, which they turned into the white white that they became famous for. We felt obliged to sample it to pay homage to all those who toiled in centuries past and those who today keep the tradition alive. It’s good. It’s refreshing and it’s just what you need after a long day of hiking and touring the five lands that make up this fantastical area. There are about six billion people in the world. 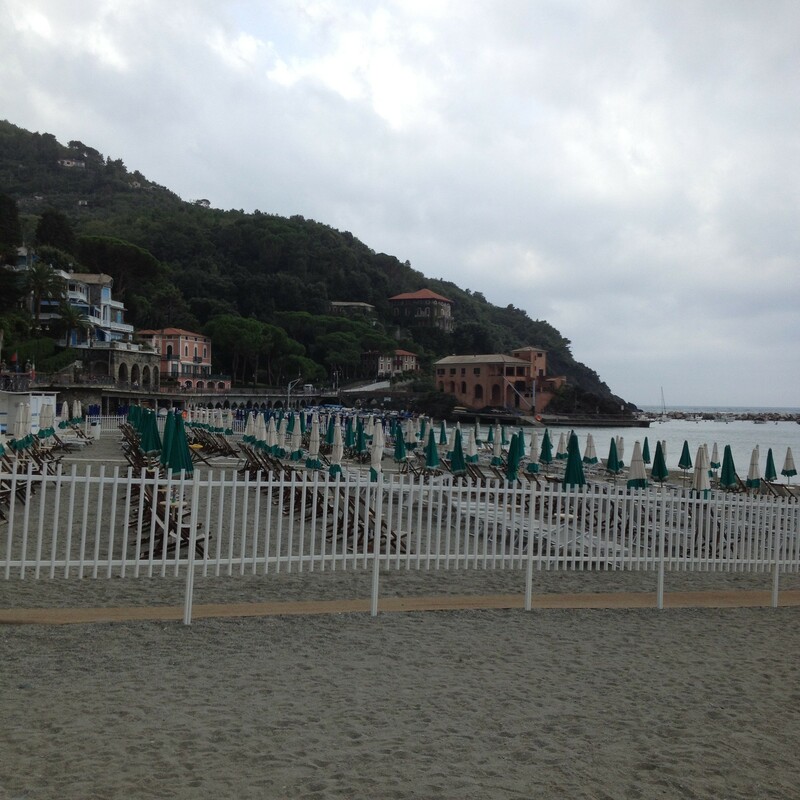 About half of them were in the Cinque Terre when we were there. It wasn’t just crowded, it was jam-packed with people. Americans, British, German, French – you name it, they were in the Cinque Terre. I always say that things are touristy for a reason and the Cinque Terre is no exception. It was so crowded that we couldn’t get a hotel in any of the five cities. We had to stay in Levanto, which is just north of the Cinque Terre and was actually a very good base for exploring the area. Levanto is a pretty, coastal town with great sea views, great restaurants, and not nearly as many people as the Cinque Terre. 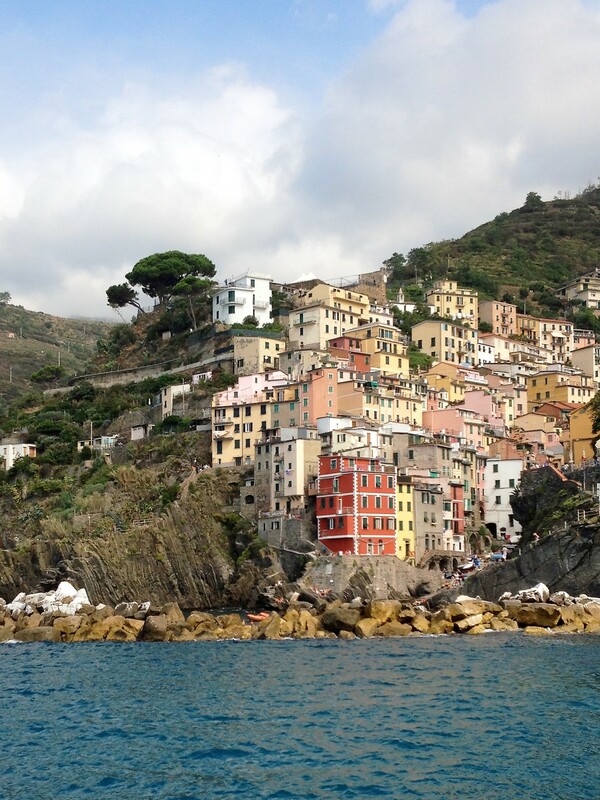 We were only in the Cinque Terre for two nights and one full day and we wanted to see it all. So did the other three billion people who were there. We were interested in doing some hiking along the many trails that hug the coastline and go up into the hills and a very helpful gentleman at our hotel recommended a trail to us. He suggested we take a bus from Manarola to Volastra which is up the hill. 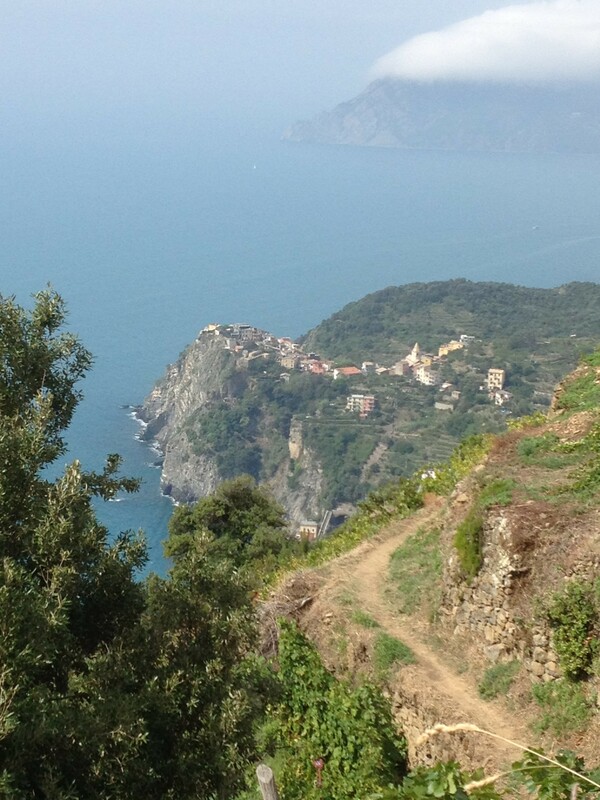 Then from Volastra you can hike to Corniglia, which is the next Cinque Terre town, the only one not on the sea. He suggested this because many of the coastal trails were closed, something that’s pretty common. The trail wound through the hills above the shore and passed through vineyards and a beautiful forest before descending down to Corniglia. Our friend at the hotel was wise in telling us to take the bus up to Volastra and hiking down to Corniglia. The narrow path was mostly level until the very end when we had to take a pretty steep descent. But it was much better than going up, we all decided. And judging from the looks of those who passed us going in the opposite direction, we were right. This trail cuts right through the middle of the vineyards. It’s fascinating to look down (or up) and be amazed at how this land is tended. 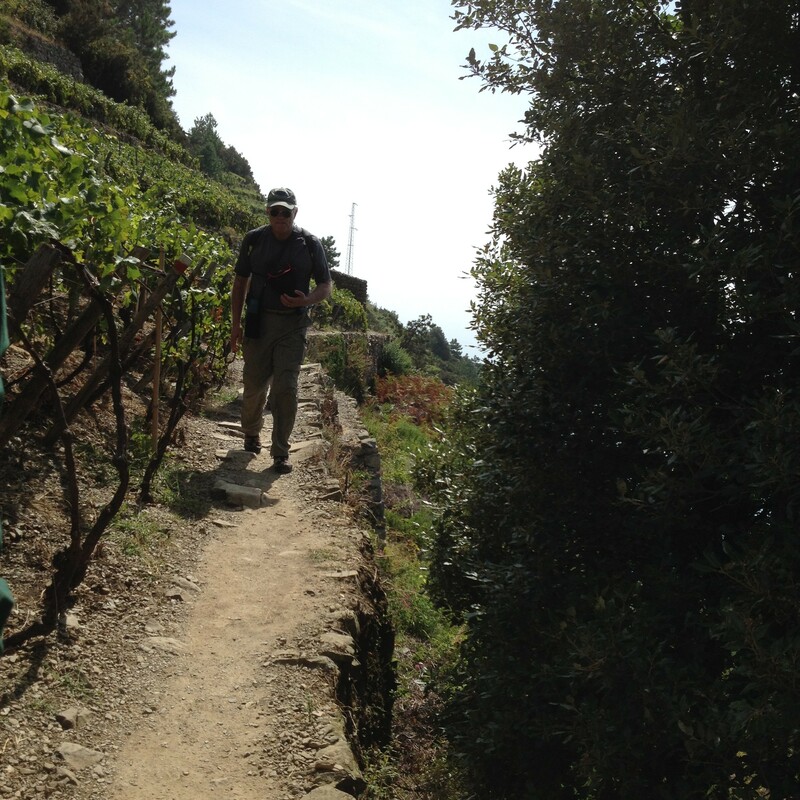 It is so steep that in some places it is almost vertical, yet there are acres and acres of grapes and olives thriving. They have a funicular of sorts to transport themselves and their tools up and down the hills. 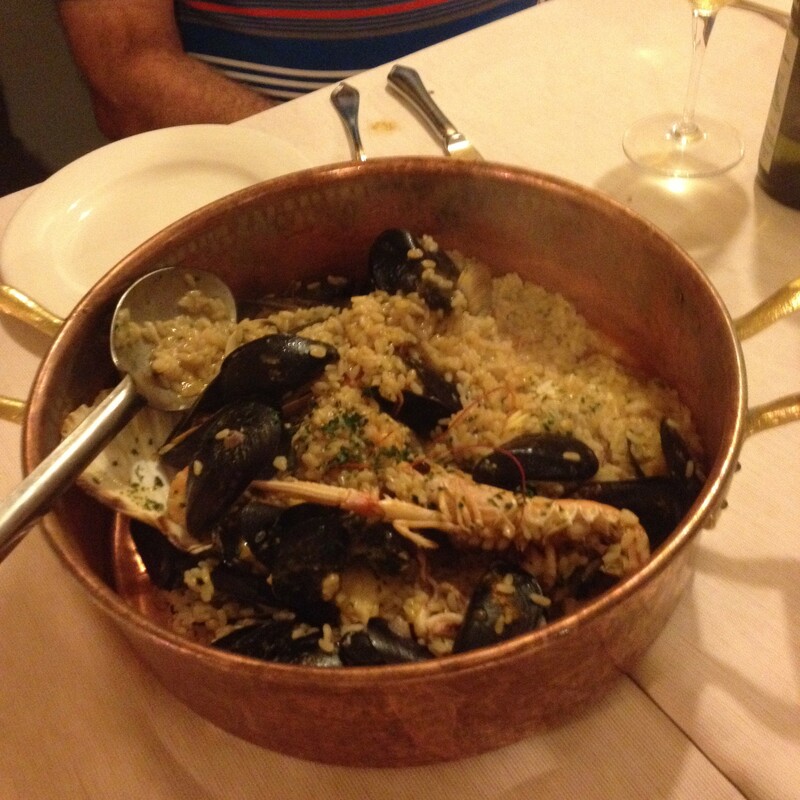 We were pretty hungry by the time we arrived in Corniglia. Of the three billion people who were in the Cinque Terre, about 1.5 million of them were in Corniglia when we got there. Beautiful town, but incredibly crowded. And we were hungry. We grabbed a sandwich and made our way to the next town, which was Vernazza. There are trains which run between the towns and they are a great way to get around. When they run on time, which was never in our experience. We spent most of our time waiting on trains. We did take a ferry between a couple of the towns, which was great because 1) there was a nice breeze, and 2) the views were incredible. They, too, were jam-packed with people. Of the three billion people there, about half a billion were on the ferries. We visited all five towns, but the last two were blurs in my mind. We were hot, tired, hungry and dirty and pretty much over the sightseeing. We got back to Levanto. cleaned up and had a fabulous meal. We felt like we deserved it after our day of hiking through the vineyards, waiting on trains, and standing on the crowded ferries. 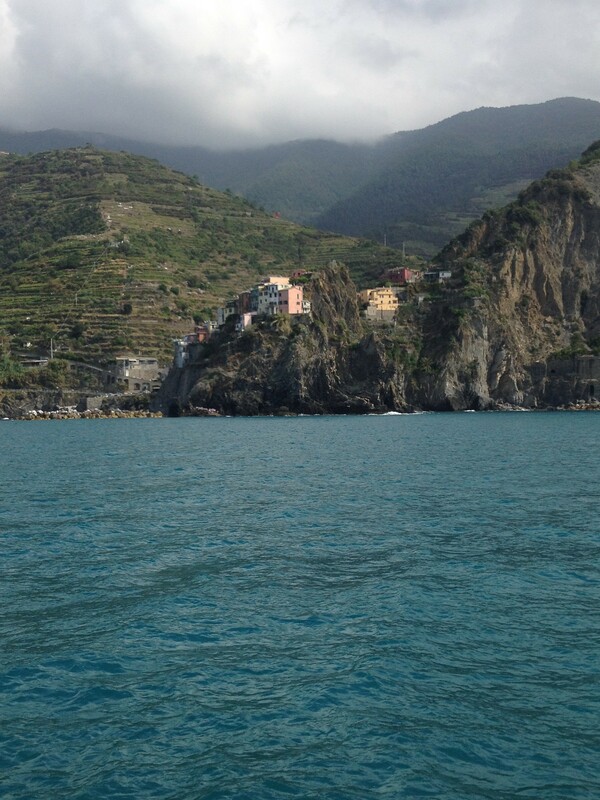 The Cinque Terre is beautiful and a wonderful experience. The trains are unreliable and crowded and the towns are overrun with tourists. Tourists just like us who came to see this incredible piece of Italy that defies comprehension as a civilization. Looking at this terrain, it’s hard to believe that anyone ever thought it was a good idea to build towns here. But they built five of them and they’ve withstood the elements and the ages and offer us a glimpse into a time when people made the most of what they had. It may not have been ideal, but it was theirs and they were determined to make something of it. And did they ever. Now for the food. Seafood all the way. Incredible, fresh and wonderful. We hopped on the train the next morning and made our way back to Anghiari. This time we didn’t miss a train and it was very easy. We were glad to be back in our apartment in our town, but we were also glad we had the experience of going to the Cinque Terre. It’s another reason we chose to have our sabbatical in Italy. There’s so much to see and do here and the rest of Europe is at our fingertips. But for now we’re back in our apartment with our friends, awaiting our next adventure.